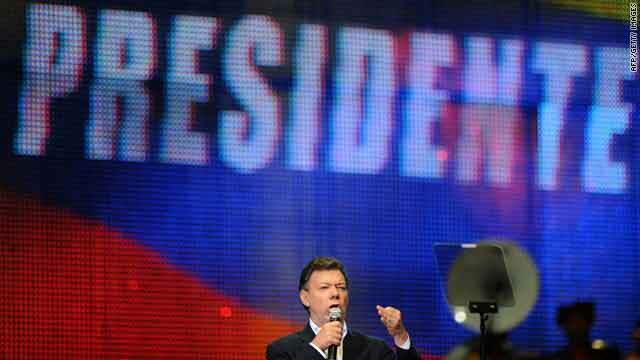 Colombian President-elect Juan Manuel Santos delivers a speech in Bogota on Sunday after the presidential election run-off. (CNN) -- Former Colombian Defense Minister Juan Manuel Santos declared victory Sunday in Colombia's presidential runoff, winning more than 69 percent of the votes with nearly all votes counted. During a victory celebration in Bogota's El Campin coliseum, Santos vowed to continue his fight against the Revolutionary Armed Forces of Colombia, or FARC, a leftist guerrilla group that has been waging war against Colombia's central government since 1960s. "We have been tough on terrorism and we will be even tougher now," said Santos. "We demand the release of all who are being held hostage," Santos said. Santos ran against former Bogota Mayor and Green Party candidate Antanas Mockus, who received 27.5 percent of the votes cast, according to Colombian election officials. Colombia's political analysts said bad weather and attention to World Cup soccer games contributed to what was a low voter turnout on Sunday. Santos, a member of the incumbent Social Party of National Unity, will replace Alvaro Uribe, a two-term president who won high approval ratings for his tough stand against FARC. Uribe almost pulled off a third run for president, before a court stepped in and put an end to his campaign. With Uribe out of the race but his popularity still high, attention shifted to his defense minister, Santos, seen as a leading strategist in operations against the FARC. A high-profile hostage rescue by Colombia's military gave another boost to Santos' candidacy last week. Santos has extensive experience in the federal government. He has served as minister of foreign trade, minister of finance and, most recently, minister of defense. He was educated in the United States, including stints at Harvard and the Fletcher School at Tufts University. Some of the strongest strikes against the FARC came under his leadership as minister of defense, including the high-profile hostage rescue of former presidential candidate Ingrid Betancourt in 2008. Colombia's military rescued four more hostages last weekend. Uribe announced two of the rescues last Sunday when he interrupted a televised news conference in the town of Quibdo to answer a call from the country's army commander. Mockus, for his part, had a strong following among Colombian youth, who were made aware of his campaign through social networking websites including Twitter and Facebook. Mockus was the mayor of Colombia's capital, Bogota, from 1995 to 1997 and from 2001 to 2003. According to his official website, the homicide rate in Bogota fell by 45 percent during his tenure, and he improved the city's public transportation system. In a speech after last month's election, Santos praised outgoing President Uribe's leadership and asked for supporters across the political spectrum to join his campaign.